Yeah, it is Caturday, the end of the month, which means the end of TockTober. I know many of you have posted tock shots to help cellybrate the month for Angel Derby. Thanks, only 11 month until it will be back. Mum got up purrty early today, has to go get her head furs trimmed off. It is raining today, so mum will be inside. Then later the kids will be by to get candy. Mum says I can stay back on the bed while the kids come around. Mum has already been around the house and changed all the clocks that she has to change by hand. The rest jump the hour in the middle of the night on their own. Almost the end of TockTober, it is a windy and rainy day. Mum says it needs to be more windy, bring the leaves down. Look at all those leaves still on the tree! Mum wants them down so she can finish cleaning up the yard. Plus she has to call the peoples to come and clean out the rain gutters, but won't do that until the leaves are down. This is a maple and all the other maples are the same way. Leaves haven't turned colors, mostly green, still up on the tree. It is windy today, that will help. Otherwise we are bummed that the days are so short now. We don't worry about hours on the clock, just the sun comes up, it is light, then the sun goes down and it is dark. When it is cloudy, we don't even get to see the moon light. 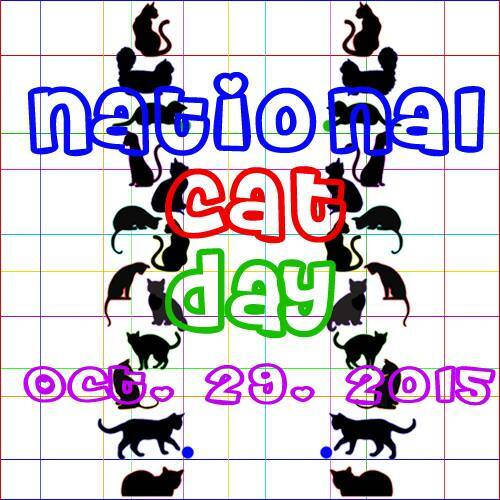 Plus it is National Cat Day. 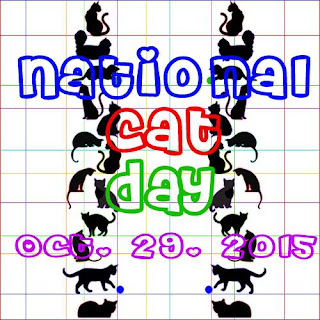 Isn't every day a cat day? Cats mean it when they kiss you. We had a lovely sunny Sunday. Our front windows catch the early morning rays and now that the the tree out front doesn't have leaves, it is even better. Mum did a short video of me in the window too. Enjoy. Nothing to report, both of the teams mum follows didn't play this week. Mum got other stuff done and didn't watch any feetsball. Next week mum's two teams, both unbeaten, will play each other on Sunday in prime time. About time mum let me get going on this. She is too bizzy trying to get her own stuff done. Like see how many green papers she has for retiring. She has a smile on her face, that is a good thing. It is slowly getting sunny, so will be napping in the sunpuddles in the windows or messing with mum's stuff on the other end of the couch. We had rain yesterday night, so mum says it is too wet to do stuff outside like cut the last of the plants down. So she will be doing stuff inside. Just don't waste so much time on playing silly games! Go read a book mum, clean the house, clean my litter box, do the laundry. Cook some good foods. I will be bizzy snoopervising her to make sure she gets her stuff done. Fall may be here but wow the weather is so nice. We had frosty, freezy over the weekend, but it has gotten nice these past few days. Highs up in the 70's. Mum says they won't last long, so we better enjoy them while we can. Mum came home last night and got the grass eater monster our, she worked on the grass but she also chewing up all the leaves. A few trees, the ash, are done dropping their leaves. So that is what you see on the ground. So here are the after pictures. Mum tries to chew up as many leaves as she can, that send the nutrients back into the ground for the grass and trees. Here you can see our little ash tree out in front, no more leaves. But you can see that the other trees, a maple on the left, locust on the right, still have lots of leaves on them. Plus tonight is the last time the sun will set at or after 6 PM until next year and then not until the hour gets hidden in the clock in March! The above pic was taken just a little bit past 6 last night. Mum is bummed that the days are getting shorter. Right now she is getting up in the dark, 10 more days then the clocks flip the hour. It will be daylight when she gets up, but then gets to drive home in the dark. That is all from the garden this week. Love Virginger, Glimmer and Trooper. 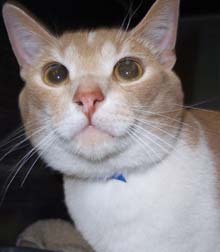 Derby - Born 10/20/03, gone to The Bridge too soon. We miss the big guy, but happy that you were here to share a good part of your life with us. 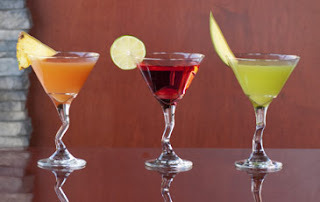 We toast you on your special day. I haven't done much jumping to high places like I used to, so the pic is from a few years ago. I do like the look of the room from up on high! Mum got cooking again yesterday. She bought a super nice chick-hen and I got a taste from it too. I got my bit of chick-hen and mum put some in her soup. I don't get to have some of the soup cuz mum says its got onjuns in it. The Pack - Phew! It went down to the last seconds. The defense saved the day by knocking the ball away from a possible touchdown by the other team. Win they did, so still unbeaten and they get next weekend off. The Broncos - pulled out a win in overtime. Mr Peyton was tossing to the wrong team, but they are still unbeaten too. Stop by tomorrow, for a little cellybration of Angel Derby's purrthday. 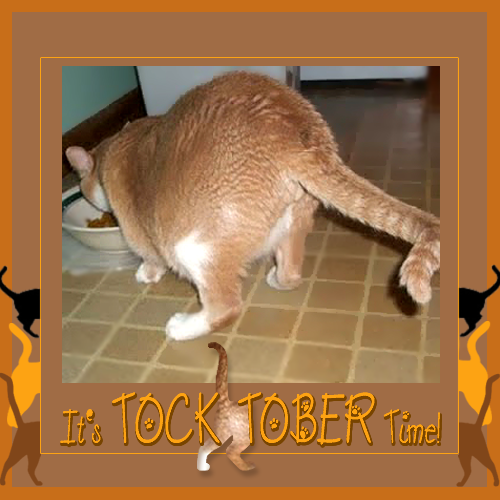 Hey everyone, it is TockTober Sunday at the Tabby Cat Club. I'm hosting the event for our club. So stop over and check out the festivities. Here is my back half, times two. HiYa, happy weekend to all. Me and mum are set to chill for a bit, then she says she needs to get outside and do a few chores. I had a mum day yesterday, but she was a bizzy purson, so wasn't home all day with me. One of the places she stopped in was my shelter. She is sorta looking for another kittie, but that kittie must be a purrfect fit. So far nothing has even come close. She did see lots of kittens, so she got her kitten fix. Most of the kittens had just been fixed. She got a good laff from one of them, this kit has CATITUDE! We have nothing to report! Mum did very little in the garden. Well she did put some mulch down, cleaned up a spot and put grass seed down. Bare spots got grass seed. BUT no pictures! Mum says she will start to cut down the garden this weekend. Plus we had a tiny bit of frosting on the roof, it may be freezing on the ground by Caturday AM! So another tock shot of us. Happy days. Fooey! Mum got home late from day hunting, not as bad as a few weeks ago. She had to run a report that had to get all the right numbers. Seems her day hunting gig company got bought by another company and today was the day! Mum says it was more boring than anything. Waiting for a system to be backed up and come back on line so she could do her thing. So lots of hurry up and wait. Now she is home, chillin' with me. I will get her all relaxed, plus maybe a glass of wine! For her, not me! So I will hang out here and just keep purring at mum. Maybe swat at her dangling earrings. This picture was not taken today. I just love messing with mum's earrings, swat, put the bitey on them. Woohoo, we had a marvy day yesterday. It may have been our last day with really warm temps, so mum got the windows open early. A bit of a morning wash in the window, but ho, I think I see a sqwerl! Yes mum, I see you are taking pictures of me. But I am picture worthy! Mum got lazy in the afternoon, she did a few chores, then just planted her bum in a chair outside and soaked up some rays and warms. The Pack - Pulled out a win, still unbeaten, although it wasn't a pretty win. ARodg broke his streak and threw it to the wrong team, TWICE! But our defense returned the favor catching FOUR of the other guys passes, including one for a pick six! The Broncos - They won, but not becuz of Mr Peyton. The scoring was done by the defense and the kicker. Oh well, a W is a W.
Yipee it is the weekend. Mum is all happy, even though she had to get up and get going to get her flu shot this AM. She is already back home and done with that. The rest of the day is for us! She says she has stuff to do outside, get foods and cook. Probably read a book. This was me last night. I was snoozing behind mum and was keeping her neck all warms. I get warms from her too. Plus this weekend, like tomorrow, it is supposed to be super nice out and warms. That means open windows. Then once I get my nap in, me and mum read the blogs. Here we are checking up on Waffles and Katie and company. Mum tried that flying move with me and I flipped over in her hands. I didn't like being upside down! Things are quiet around here. Not much going on, a slight bit of color in the trees. More to come soon and then they will all fall off the trees. Mum will then have lots to do outside! The sedums are all a deep maroon color. Start out pinky and just keep getting a deeper shade. Mum mowed the new grass on the side of the yard on Tuesday. It filled in really well and she is super pleased that there won't be icky dirt or mud here. The impatients look like they are all bloomed out. Sort of look like they got frosted but we haven't even been closed to having a frost and probably won't for a while. The weather guesser says it will be nice through next week.Well, that is what they say today! Mum had a good check up with the dentist, no issues, come back in six months. But she knows the guy so then they talk racy cars for a bit. That is all. Love, Virginger, Glimmer and Trooper. Yay, we had sunshine today. Didn't see the ol' Sol since last week. He hid all weekend and Monday. Even mum was in a better mood and it got a bit warmer around here too. Mum could be outside without a jacket. Mum got all sorts of chores done tonight. Grass all mowed, library run done and she picked up a sub for dinner. I like that cuz she shares, but she couldn't share tonight, they put onjuns on it, even when mum said not to. So she sent off a customer complaint to the company. They are a local place so she knows they will answer. Not one of those big national chains. Mum has to go get her tooths all checked out tomorrow. Gotta keep that purrty smile. Old Geoff had the right idea, feed us good stuff and a nice place to nap and sleep. 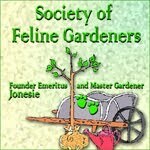 We kitties will be happy. The weather has turned, mum even turned on the heaty monster on Caturday night, even she was cold, specially her hands. All cloudy, so mum didn't even really do much outside. Sat in her chair reading and I kept an eye on her. She finished one book and started on another. The Pack - wnt to the left coast and beat up on the gold digging 49er's. They managed to keep old QB Colin in check. ARodg was his usual good self, didn't throw it to the wrong guys. The Pack is 4-0. The Broncos - Peyton and company played the Viqueens and beat them down. They are also 4-0. Hey everyone, Happy Sunday. That is not me, that is Derby. I asked mum to feature him since TockTober is his birth month. Hope you like seeing his face. Cool here, mum even turned the heaty monster on for a while yesterday. Even SHE was cold! MOL. 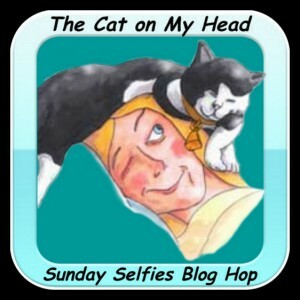 It's a blog hop, hop on over to The Cat on My Head to check all the other posts! Yay, mum is happy it is the weekend. She is done with her bizzy week day hunting. So she can chill this weekend with me. 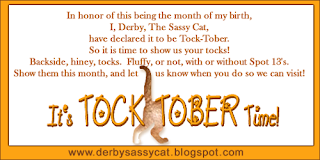 Plus as the girls said this past Thursday, we are in TockTober. All for Angel Derby. So if you can, show us your tocks, backside, hind end, tush or whatever you want to call it, to help cellybrate.Thanks to Miss Ann we have nice badges for this. Me, well I will be coy with showing my tocks. I don't flaunt mine the way Derby did. See above! Mum is reading, with me snoopervising her reading. Plus she is cleaning out closets and getting rid of all sorts of stuff. Will all get donated, lots of mittens, gloves and scarves. People can use them when it gets cold. Plus welcome to a new month, one of our favorites, TockTober!! Mum found all sorts of fungi in the lawn this last week. White ones and yellow ones. Must be all the rain we have gotten. tPlus to cellybrate TockTober you gotta have tock shots, so here we go! First a group shot and then one for each of us! That is all, mum has been so bizzy at work not much time for other stuff. Love, Virginger, Glimmer and Trooper.